Philadelphia Eagles news and links for 4/12/19. Another day, another mock draft. Earlier this week we looked at Todd McShay’s “Grade A” simulation for the Philadelphia Eagles. Now Mel Kiper has an ESPN mock of his own where he’s projecting what every NFL team SHOULD do and not necessarily what they WILL do. Here’s a look at what Kiper thinks is best for the Eagles. Easton Stick, North Dakota State (6’1, 224): Yeah, it’s easy to pinpoint the NDSU quarterback, since the Eagles already took one in Carson Wentz, but I do think they’ll like Stick for some of the same reasons they liked Wentz. Like Wentz, Stick had a great GPA (3.91), and he even graduated in 3.5 years. He also ran an offense in Fargo with more pro-style concepts than most quarterbacks coming out of college, and is adept at running RPOs, particularly because of his good timing and mobility. At NDSU, Stick won two FCS National Championships. Unlike Wentz, Stick is only 6’1, and he does not have good arm strength. The Eagles are showing serious interest in the top DTs. Ed Oliver and Christian Wilkins aren’t likely to be around at 25. The Eagles are probably trying to figure out just how much they like those guys and how much they should consider trading up for them. Remember that you draft not only a player, but a person. The more you invest in a prospect, the more you want to know. Jerry Tillery should be on the board at 25. He also makes a lot of sense for the Eagles. He’s athletic and disruptive. This is the kind of athletic DT you want on the field in 2019. Snacks Harrison has his place, but guys like Tillery can make more of an impact. [...] If I’m guessing where the Eagles go in the first round, DT is the position. Nothing is a lock, but it just feels like that is most likely. The ideal pick would be defensive end given the importance of the position and the fact the Eagles need to replenish there with Brandon Graham (31), Vinny Curry (30) and Chris Long (34) all in their 30s. Clelin Ferrell is a name worth keeping an eye on. He isn’t the most athletically gifted player, but he has some polish to his game and is known for his high motor and production (27 sacks in his last three seasons at Clemson). That sounds similar to Derek Barnett, whom the Eagles selected No. 14 overall in 2017. Jerry Tillery, DT, Notre Dame (Overall rank: 34; Projection: First round): His production probably wasn’t quite at the level teams would’ve liked, but Tillery (6-foot-6, 295 pounds) still had seven sacks last season. He moves impressively well for a man his size and plays with a high motor. Analysts have compared him to guys like DeForest Buckner and Chris Jones. The question with Tillery is consistency, but he has big upside. And if he were to realize that potential next to Fletcher Cox, the Eagles would have the most terrifying pair of defensive tackles in the league. 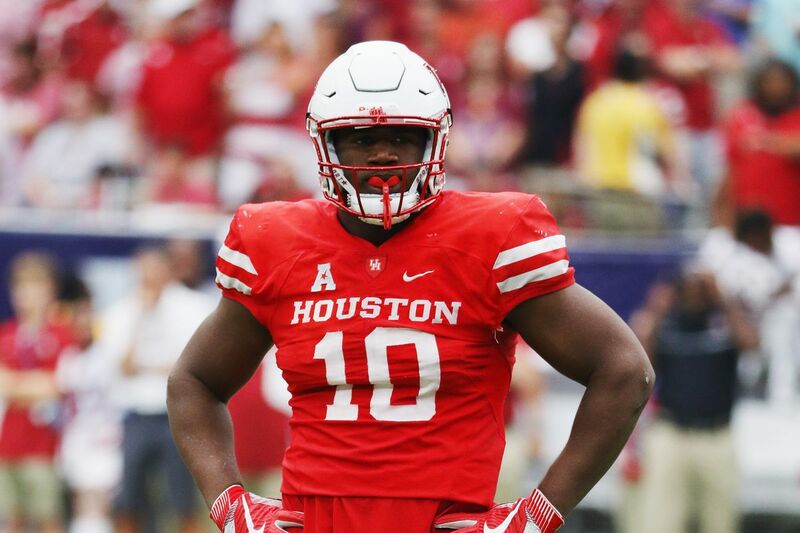 2) Ed Oliver: IDL, Houston. Oliver is going to be a great pro. I do think he needs a good fit: a modern defensive coordinator who’s willing to maximize his strengths by slanting him, twisting him, and giving him alignments outside the 3-technique on long-and-late downs. But whichever team has that coordinator, that team will rank Oliver more highly than the other squads, so there’s a good chance he ends up there. (We’re looking at you, Atlanta.) Can’t teach quicks; can’t teach bend; can teach rush moves, but usually they’re not as good as Oliver. Stud. Olamide Zaccheaus, wide receiver, Virginia. Hometown: Plainfield, New Jersey. High school: Saint Joseph’s Prep. While I may seem like a super serious journalist, I’m going to pull back the veil a little bit and show my bias: I am a graduate of The Prep. Zaccheaus was a freshman when I was a senior and I almost assuredly never even walked past him in the hallway at 17th and Girard, but I’m going to pretend that we’re good friends anyway like every other alum does. He was a star running back during his high school days, but has since switched to receiver at UVA. What if he switched back though? Marquise Brown is a good wide receiver, but the fact that he is this year’s best prospect speaks volumes about the mediocrity of top of this wide receiver draft class. According to Playmaker, Brown is the weakest “top prospect” in the last half-decade. Every draft since 2013 has had at least one wide receiver prospect who scored higher than Brown. That said, because most drafts have more than one successful receiver, it’s not necessarily a knock on Brown that he is the best of a relatively uninspiring class. Brown earns points for entering the draft as an underclassman, for accounting for a large share of the passing yardage in Oklahoma, and for averaging over 18.0 yards per reception. Brown’s weakest point is his relative lack of touchdowns. Brown scored on 2.5 percent of Oklahoma’s passes as a junior. That is not a bad rate, per se, but it is a bit lower than those of top wide receiver prospects in the past. Although weight is not a part of Playmaker, Brown is unusually light for a top wide receiver prospect. Brown weighs in at only 166 pounds. Since 1996, the lightest wide receiver drafted in the first round was Tavon Austin, who weighed in at 174 pounds. When Stanford running back Bryce Love decided to return after a record-breaking 2017 campaign, eyebrows raised collectively across the NFL. Love’s draft stock had nowhere to go but down even if he improved his stats; the few hundred or so more hits he’d experience would only increase his injury risk in NFL teams’ eyes. And down his stock went. Love was largely ineffective hampering an ankle injury to 4.5 yards per carry before tearing his ACL in Stanford’s season finale. Pretty much everything that could go wrong for him did, but exactly how much should that torpedo his draft stock? When healthy, Love’s 2017 tape was the most impressive of any back in this class. Lane Johnson defends Carson Wentz by calling Donovan McNabb a snake [UPDATES] Shots fired! The Linc - Looking back on how the Jason Peters era began 10 years ago Philadelphia Eagles news and links for 4/22/19. Here’s a list of every known 2019 NFL Draft prospect the Eagles have shown interest in Looking for clues. ESPN writers from Eagles’ opponent teams predict Philadelphia’s 2019 record Outsider perspective. This Article has a component height of 22. The sidebar size is long.